Notepad is one of the essential items on your desk. A professionally designed draft pad is a multi-dimensional product, working many ways. For example, it can help you create memos, bills and small drafts plus you can also promote your brand by printing your commercial slogans and logos on it. Hence, printing pads are perfect items for customer giveaways, business notes and reminders' list. Their effectiveness in the advertisement and brand promotion is more evident as compared to stickers and decals because notepads are functional item that are not generally perceived as boring advertisement tool. If you are looking for some quality notepads, we can offer you many delicate designs and sizes of them. Be it some popular or custom size, we can offer you everything as per your requirements. Using our state of the art printing machinery, the creative designers will come up with the most dazzling memo pad designs for you. In addition to this, we give you freedom to design your product as per your requirements and specifications. Instead, customers take them happily as a gift from marketers and use them for their domestic and office works. 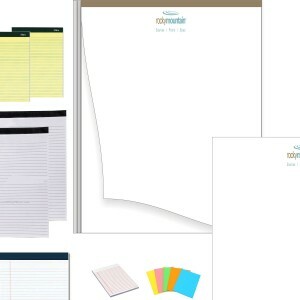 There are many popular, custom and standard sizes of notepads, which you may order. 4.25" x 5.5", 4" x 9", 5.5" x 8.5", and 8.5" x 11" are the most popular ones in this category, though size can be customized. Even you can design your own notepads at RegaloPrint, taking advice from our qualified designers. With every order, we offer you many value-added services like custom designing, unlimited design revisions, and shipment for FREE. You can share your questions, concerns and ask for samples at our friendly customer support. For orders and general queries, use live chat window, telephone line or send us an email; we promise a quick response everywhere.